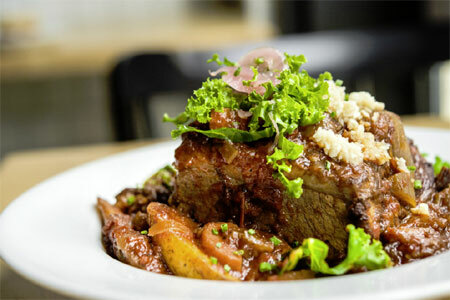 Chef Daniel Boulud's exquisite fare at a more modest price. 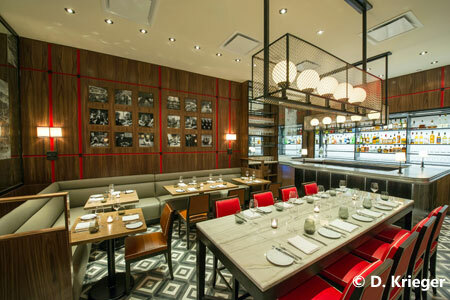 Daniel Boulud was GAYOT's 2014 Best Restaurateur in the U.S.
: We would expect nothing less of chef extraordinaire and entrepreneur Daniel Boulud than an impeccable place, in this case where dark, deep tones and grey booths create an elegant dining room. Creative dishes are offered on the seasonally inspired menu: artichoke soup with basil oil and tomato confit; country duck pâté with homemade pickled vegetables; smoked trout crostini with roasted Fresno chili. How about a $35 sirloin burger filled with braised short ribs, foie gras and black truffles on a Parmesan bun? This most-popular dish on the menu is definitely not your father's burger. Another option is the pan-seared black bass served with littleneck clams and fingerling potatoes. End the meal with a rich corn crème caramel topped with freeze-dried corn and blueberry yogurt sorbet or an assortment of cheeses. Choose from a simple, international (well-priced) wine list that includes the likes of a Nicolas Potel Volnay.